Diana Rodriguez is a Louisville, Kentucky-based full-time freelance writer who specializes in health and real-estate writing. Since 2008 her numerous articles have appeared on various news and health websites. She also specializes in custom Web content for a variety of businesses. She has degrees in journalism and French from Miami University of Ohio. While a fever may not be too concerning for most healthy adults and even older children, fever in newborns can be a very serious matter. Their tiny bodies can't yet regulate temperature, and getting too hot can be dangerous. Fever can also signal a number of serious problems. Fever in newborns should always be taken seriously, so call your child's pediatrician for advice on what to do. Fever is technically any body temperature higher than 98.6 degrees Fahrenheit. A high fever isn't necessarily dangerous, but is simply the body's method of dealing with an infection. The number on the thermometer is typically less important than the symptoms when determining a baby's condition. Always take baby's temperature with a rectal thermometer, which is more accurate at this age than a forehead strip or ear thermometer. The definition of a fever varies from month to month in babies. 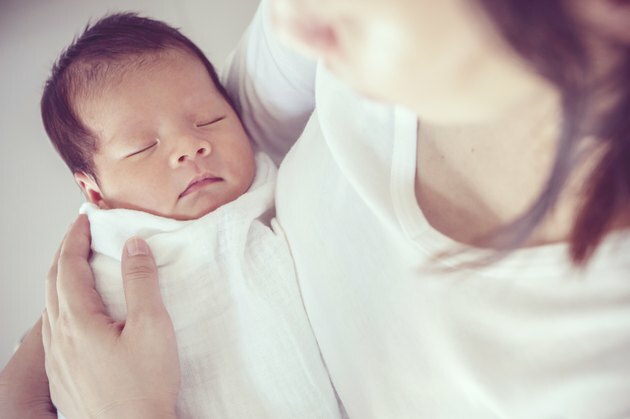 For any baby younger than 3 months old, that a temperature of 100.4 degrees Fahrenheit or higher constitutes a fever – and an immediate call to the pediatrician for an evaluation, BabyCenter says. If your pediatrician gives you other guidelines, follow his instructions. Fever in a 2-month-old may be caused by an infection, but infection isn't always to blame. A baby bundled too tightly, in a hot environment or wearing too many layers of clothes may simply be too warm, which can cause an elevated temperature. Babies who are dehydrated may also run a fever. A baby's fever is often accompanied by other symptoms, which are important for your pediatrician to know. Check your baby's skin tone to see whether she is very flushed or looks pale. Take note of whether she's eating normally or not interested in food. If she's particularly fussy or lethargic, let the pediatrician know that as well. Also look for symptoms such as vomiting or diarrhea, cough, trouble breathing, spots on the skin or indications of ear pain. Call your child's pediatrician immediately if your 2-month-old is running a fever, particularly if she is showing other signs of being sick. Never give your child Tylenol or other medication to bring down a fever unless your pediatrician recommends it, says the Palo Alto Medical Foundation. Keep your baby comfortable and don't let her get overheated with too many blankets or clothes. What to Do With an Infant With Skin Hot to the Touch?